Zach gets behind another seasonal tradition. Each year on Christmas Eve, Zachary, who is nine-going-on-thirty, places a plate of Christmas cookies he's baked himself (under guidance, of course) and a glass of milk on a tray table near the tree for Santa. Since he's been able to write, he's also written Santa a note. Santa always leaves a reply. 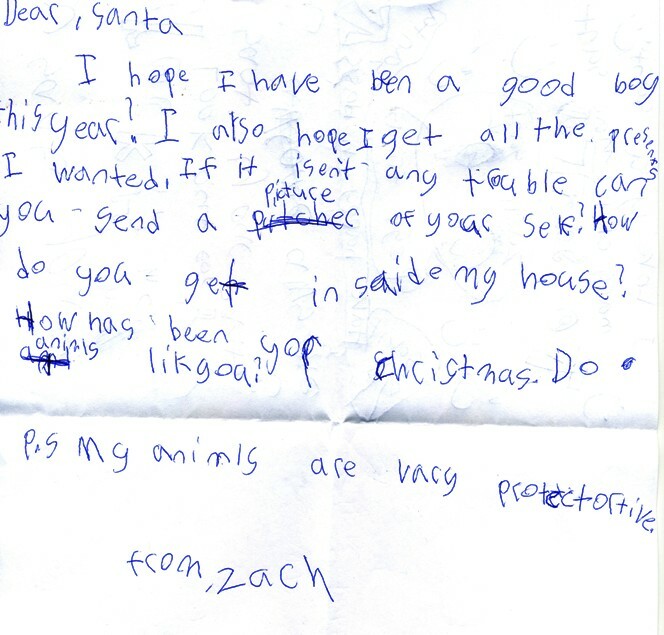 Zachary's note this year was so sweet and sincere, and Santa's reply so insightful, that we agreed I should share them with you. Dear Santa, I hope I have been a good boy this year. I also hope I get all the presents I wanted. If it isn't any trouble, can you send a picture of yourself? How do you get inside my house? How has been your Christmas? Do animals like you? Well, to everyone's surprise, Santa did leave a reply on the table where the cookies left for him had been! Ho! Ho! Ho! According to my list, you should now be old enough to read cursive writing. Thank goodness! I love writing letters to all my young friends, but I must admit that I can write a letter in cursive more quickly than I can print. Have you been a good boy this year?! Ho! Ho! I’ll say you have! Now, I’ll let you in on two secrets. First, it’s very, very rare for a boy or girl to be bad. Practically every child tries very hard to be the best person he or she can be. But the second secret is, you happen to be unusually well-behaved. You thank people when they do something for you; you do thoughtful things for others and you serve as a good example to your friends. No wonder everyone loves you so much! —Including me. 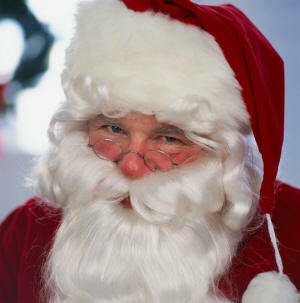 Now, all of us can stand some improvement, even me (as Mrs. Claus so often reminds me)! The purpose of life is to improve ourselves year by year. You might consider working to develop a little more patience for people you think are not keeping up with you or don’t understand what you mean. If you try to see things from the other person’s point of view, I bet you can see where the disagreement or confusion lies, and then it’s usually a simple matter to clear things up. Ask yourself: "Why did this person say or do that? It’s not about me, it’s about how he or she sees the world. So, how do they see the world that would make them say that or act like that?" When you have learned to answer that question, you will find that things will be much easier for you and for the people in your life. Thank you for asking about my Christmas. My Christmas is a work day, but I love my work so I love Christmas. I only get to spend a fraction of a second in each house, but that split second seems like an hour or so to me, so I feel like each Christmas lasts a year or two! Which is why I need a cookie and some milk in each home to keep me going. (But only one cookie—Mrs. Claus is very firm on that point!) Because I am only in your home for a moment, I am gone before your animals can notice me. Sometimes a dog might sense I have been there and bark, but I am many houses away by then! As to how I get into your home, well, it’s a little hard to explain but I will try. You are old enough now to understand I am not an ordinary person. I am the Spirit of Christmas, the feeling people have when they open their hearts and give their love to others and allow others to love them in return. Wherever there are loving people, I am always there. So you see, I don’t exactly come "into" your home. Because your home is filled with love, I am already there, as well as everywhere else there is love and where people celebrate the Spirit of Christmas. Merry Christmas, dear ones! May all your Christmases be merry, and all your days be bright.